Fall 2014 UPDATE: The UBS5 is out. Go here for a chance to win one of two free copies. 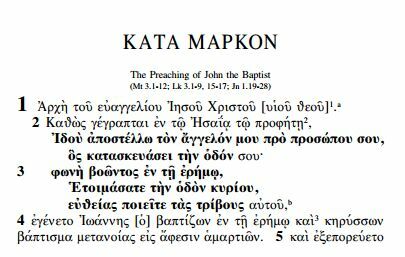 On the heels of the release of the NA28 Greek New Testament, the UBS4 is giving way to a revised UBS5. Find the book’s product page here. Just as I reviewed the NA28 (plus LXX), I hope to post more in the future about the UBS5 edition, which is geared more toward translators than academics, per se. Here’s a sample pdf of the first few chapters of Mark, posted by Hendrickson. Other than punctuation and paragraph divisions, the text is the same as that of the NA28, with the differences between the two coming in the critical apparatus. UBS5 is slated to release in May.